These little wraps are seriously delicious in an effortless sort of way. Perfect for a post-beach supper with a cold beer or a glass of rosé, or as a light lunch on the terrace. The point is that’s it’s low effort to make but full enjoyment to eat. And almost healthy. If you want to make them actually healthy I’m sure brown rice or wild rice would work too, but lets be honest; it won’t taste as nice. But they could easily be converted into a lovely starter by just omitting the rice. You see, the possibilities are endless. Cook the rice according to the instructions on the packet. Leave to cool a little. Mix the mayo. Wash and dry the lettuce leaves. Wash and cut the remaining vegetables. Heat up oil in a frying pan on medium heat. Add the prawns and fry until pink. Add Aleppo pepper or chilli flakes, salt, pepper and a squeeze of lime. Cut the prawns into smaller pieces. Fill the lettuce leaves with rice, mayo, prawn pieces and vegetables (in that order, the mayo works as a glue to hold the toppings in place), add some chopped coriander and finish with a squeeze of lime. Serve with plenty of napkins as they’re best eaten using your hands! This lovely sashimi plate with fresh vegetables, crispy onions and hot wasabi mayo is a great way to start the weekend. Just add bubbly. Heat up 2 cm neutral oil in a saucepan and fry the onion until golden. Drain on kitchen towel. Mix mayo with wasabi powder to your taste. Slice the fish and start plating everything. Scatter with coriander and serve with lime wedges and Japanese soy sauce. I prefer most my fish raw, marinated or cold smoked. Maybe it’s in my Scandinavian genes or maybe it’s because I love sushi so much. Regardless, I like to try new fresh recipes with raw or marinated fish. This version of tuna tartare is very easy to make, and feels really fresh on your palate, which is just what I like. No need to over-complicate matters when you’re using good ingredients. Do remember to choose a sustainable tuna, like pole-caught yellow fin tuna. Most important when eating raw fish is to make sure it’s super fresh. And that you freeze it before you eat it if it’s a wild fish, to kill of any bad bacteria. Farmed fish usually doesn’t have the same bacteria, but if you’re unsure do freeze it first – better to be safe than sorry. Most fish is transported frozen, if that’s the case you don’t need to refreeze it. Trim the fish and cut into small cubes. Place in a bowl. Chop the spring onions and coriander. Spoon the avocado into a bowl and mash with a fork. Season to taste with lime juice, Worchestershire sauce, salt and pepper. Season the tuna with Tabasco and lime juice. Add some olive oil to coat it. Add salt and pepper. Divide the avocado mash between two plates and shape into circles. Top with the tuna tartare and decorate with spring onions and coriander. My go-to guacamole recipe has always been my own concoction from when I was younger and tacos became the staple Friday dinner for all Swedish families. It’s very nice (my best friend can testify to that), but as it contains creme fraiche it’s far from a proper guacamole. So a few weeks ago when I found the best tortilla chips ever in my local Whole Foods (oh, how I love saying that!) I thought it was about time to try a slightly more authentic version of guacamole. And the result was amazing! It’s so easy to make, and quite healthy (if you don’t count the tortilla chips) and it has become my new obsession. Spoon the avocados into a bowl and mush up with a fork. Add the chopped tomatoes and onions. Add lime juice (start with the juice from half a lime, add more to taste), a few drops of Tabasco and Worchestershire sauce. Add salt and pepper and mix well. Chop the coriander and add to the guacemole. Check the seasoning and adjust if needed. Serve with tortilla chips or with any Mexican or Tex Mex dish. 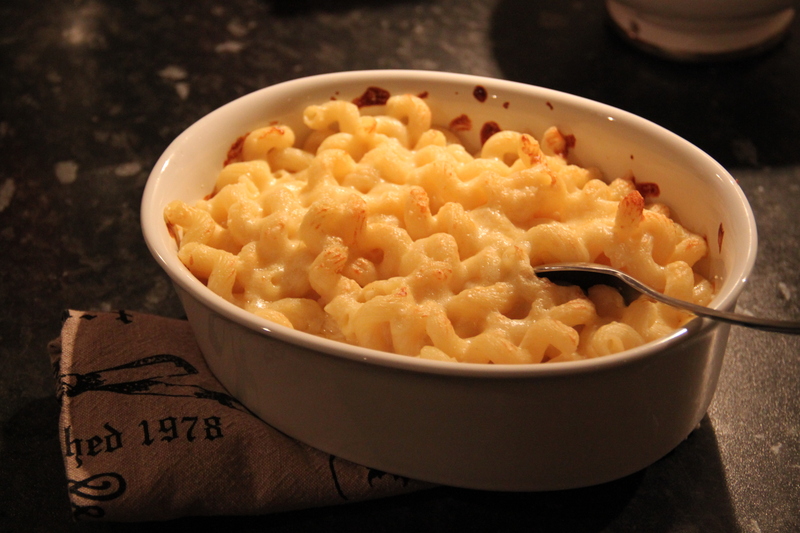 When the weather is biting cold and one has little energy or body warmth when stepping through the front door I’m of the opinion that mac ‘n cheese is the answer. It’s cheesy and comforting (for me that’s the same thing! ), warm and filling and utterly delicious. Although there is no such thing as too much cheese it’s nice with something sharp cutting through the creaminess and this is where the broccoli slaw comes in. It’s fresh, zingy and healthy. 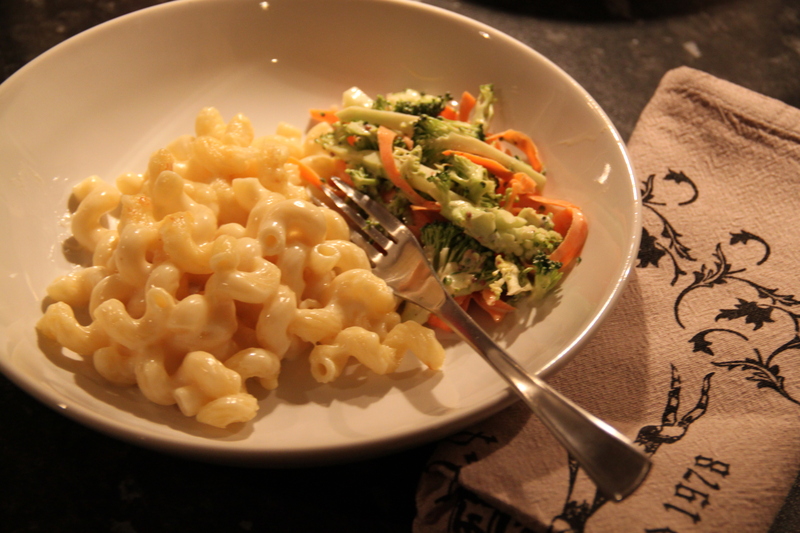 The perfect counterpart to the heavy mac ‘n cheese! Cook the pasta al dente. Meanwhile, melt the butter in a non-stick saucepan. Add the flour and stir for a few minutes. Add the milk a little at the time while whisking and the sauce thickens. Add the cream little by little while whisking until you have a thick bechamel. Add the cheese and stir while it melts on lower heat. Add the wine and season with salt and pepper. Drain the pasta and mix with the cheese sauce. Pour the cheesy pasta into an oven-proof dish, sprinkle with grated cheddar and place in 200C oven for 5-10 minutes until the cheese on top is bubbly and golden. Slice the broccoli, including the stem and cut into matchsticks. Grate the carrots. Mix mustard and mayo in a bowl. Add the lime juice then add the vegetables. Mix well and season. Sometimes I can really crave crab and when I do I find the packets of fresh crab meat in the super market especially handy. Of course a freshly cooked whole crab is nicer but it takes quite a lot of time to pick out the meat, so for a weekday I really like the packets. 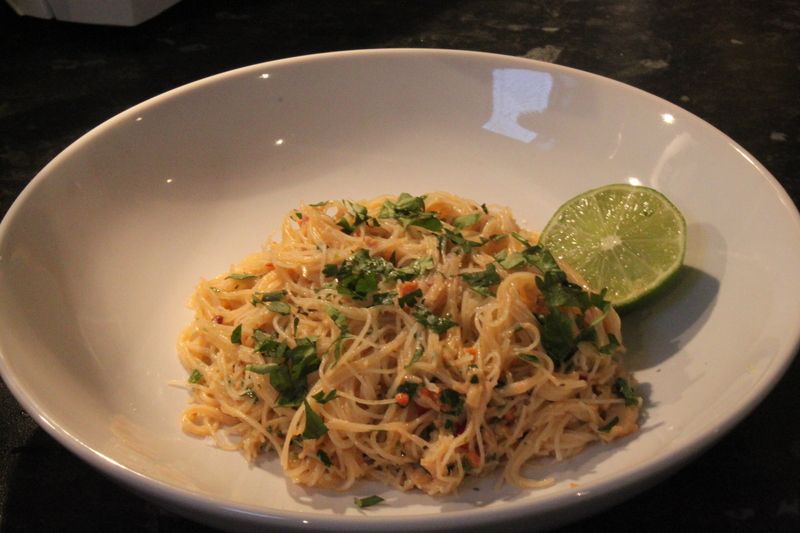 This dish with vermicelli rice noodles, crab and butter to carry the flavours of chilli, lime and coriander turned out really well and feels light and fresh. Perfect summer grub if you ask me! Place the noodles in a bowl and cover with boiling water. Slice the leek and finely chop the chilli. Melt the butter in a frying pan and add leek, chilli and lime zest and fry for a few minutes without browning. Add the coriander and crab meat and stir. Season. Drain the noodles and add to the pan. Turn off the heat, stir and add the lime juice. One thing I have in common with my mother, is that the worst thing that could happen when having people over is if they were to leave still feeling hungry. On Friday, however, there was no chance of that happening. We were so full that I had to rethink the pudding. 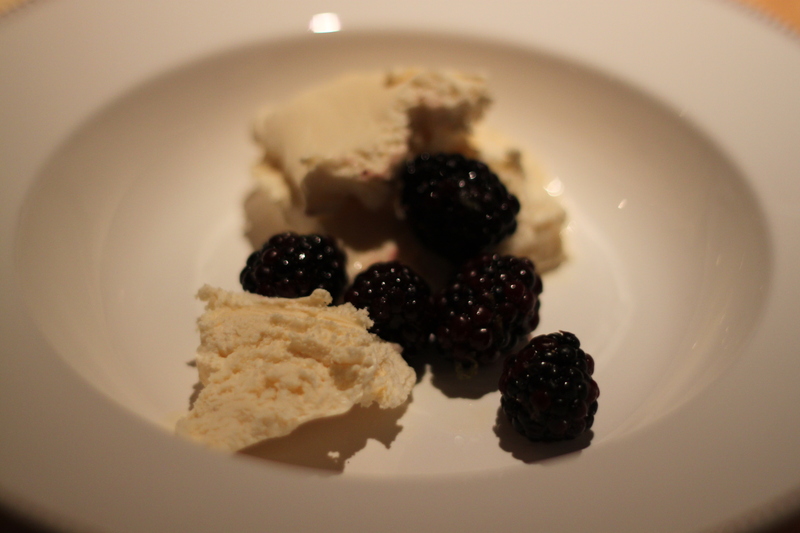 My plan was to make molten chocolate cakes served with homemade vanilla ice cream, but instead we opted for a more refreshing approach; the same ice cream served with blackberries in lime sugar. Although I love berries I think they can be a bit bland on their own which is why I like to serve them like this, with some caster sugar, fresh lime juice and zest. Beat the egg yolks and sugar until pale and fluffy. In the mean time heat up the cream, milk and vanilla in a saucepan. Pour the warm cream mixture into the sugar mixture while whisking. Place the bowl in a bain marie and whisk while the mixture thickens (about 10 minutes). Leave to cool in room temperature, then place in fridge to cool, preferably over night. Make the ice cream using an ice cream maker, about 40 mins. In the mean time place the intended container in the freezer to cool down. Freeze for at least 45 minutes before serving. Mix the zest and juice with the sugar and mix with the berries. Serve straight away.